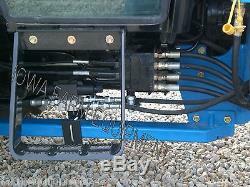 Complete Third Function Kit for New Holland Tractors & Loaders. Expect This'Third Function Kit' & ALL Of The Equipment We Sell To Be Quality Equipment That Will Serve You Well For A Lifetime! 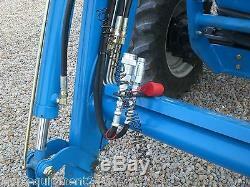 This is a True'Third Function Kit' - NOT a Selector Valve or Splitter Configuration. With a True'Third Function Kit' the Grapple (or other attachment) can be Operated Independent of The Bucket or Loader Functions, and can also be Operated Simultaneously with Either of Those Functions. Suitable for Hydraulic Flow Rates up to 12GPM. Kit Ships Complete & Ready to Install Including These Major Components. 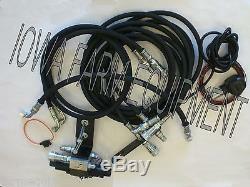 All Required Hydraulic Hoses & Fittings. Standard Front Couplers are 3/8'Pioneer' Style! Mounting Brackets for The Front Couplers. 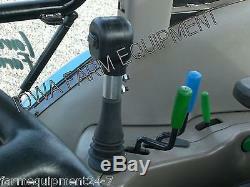 Replacement Handle with Integrated'On-Off' Switch to Use on the Tractors Existing Joystick. Remote Electrically Controlled Valve with Wiring for the Joystick Mounted On-Off Switch. 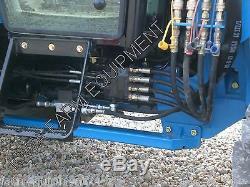 Sample Photos Show 3rd Function Kits Installed On Open Station & Cab Tractors For Reference Only. The Actual Kit Will Be Only For Your One Specific Application. To Ensure the Correct Components, You MUST 1 Provide us with the Specific New Holland Tractor & New Holland Loader Model Numbers & 2 Advise If The Tractor Has a Cab. Plus We're Glad To Say This Kit Is MADE IN THE USA! The item "3rd, Third Function Hydraulic Valve Kit New Holland Tractors & Front End Loaders" is in sale since Wednesday, November 28, 2018. 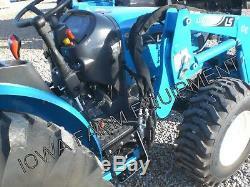 This item is in the category "Business & Industrial\Heavy Equipment, Parts & Attachments\Heavy Equipment Parts & Accessories\Tractor Parts". 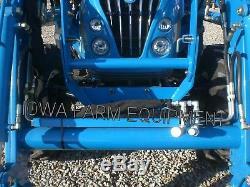 The seller is "farmequipment24-7" and is located in Tipton, Iowa.